Doors Open 7.30pm, Showtime 8.30pm - 11.00pm (with intermission). Jo Jo Zep and the Falcons and Rock Doctors join forces for a memorial concert celebration for their much loved friend and bass player John Power. This is a fundraising event and all profits will be paid to John’s immediate family as a gift. John Power died in November last year after prolonged health problems. He was a much loved man amongst Melbourne and Sydney musicians and music lovers alike. Over his nearly 50 year career he was best known as the bass guitarist/ singer in Jo Jo Zep and the Falcons but he also played and recorded with many other great Australian bands such as Company Caine , Foreday Riders, The Rock Doctors and the Hippos. 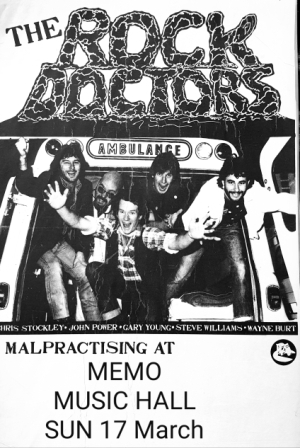 Friends of John wanted to pay tribute to him and when asked Joe Camilleri and Chris Stockley were keen to get on board and reform two bands that John was synonymous with Jo Jo Zep and the Falcons and the Rock Doctors for a one off concert in Melbourne.. Musicians, crew and all involved are volunteering their time and all proceeds will go to John’s daughter who cared for him in his final years. JO JO ZEP & the FALCONS + ROCK DOCTORS feature JOE CAMILLERI, JEFF BURSTIN, CHRIS STOCKLEY, WAYNE BURT, WILBUR WILDE, TONY FAEHSE GARY YOUNG, STEVE WILLIAMS, PETE MUHLEISEN, HAYDN MEGGITT & TRAVIS CLARKE. On the news of John’s passing tributes flowed on social media…. “My dear pal…is glory bound today,” said Joe Camilleri, leader of Jo Jo Zep & The Falcons and The Black Sorrows, online. “Loved his company his wit and musicality…walked into each other’s lives not too much was said. John played bass and could sing in that world…he was the business. Don’t miss this rare chance to see these two fabulous bands . It promises to be an extraordinary night! This is the only gig for Jo Jo Zep & The Falcons + Rock Doctors, better be quick!